The Smart KM switch lets you share a single keyboard / mouse to switch between two computers; allowing you to copy files and cut/paste text/images between two computers. You can drag/drop across 2 monitors with the mouse. Compliant with USB2.0 specification. Support USB keyvoard and mouse. File / data transfer between two computers. Copy paste between two computers. Datalink function conforms high speed USB specification. Plug & play. Cable length : 5Ft (USB2.0 A to Mini 5Pin). 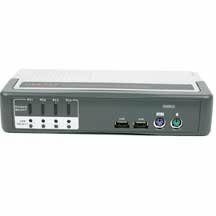 The LDV-242AUSK is a 2-port Compact Desktop DVI USB KVM Switch with Audio and Mic switching function. The Linkskey LDV-302ARC is a 2-port compact DVI USB Cable KVM Switch with two sets of fixed USB/Video/Audio/Mic combo cables and a wired QuickSwitch button for easy connection to your two computers. The Linkskey LDV-DM02ESK Dual Monitor DVI KVM Switch is designed specifically for sharing two DVI Monitors/Flat Panel Displays between two Dual DVI Monitor-enabled PCs. You can use it to control two Dual DVI Monitor-enabled PCs using only one keyboard. one mouse and Dual DVI monitors/Flat Panel Displays. The Linkskey LDV-DM02ESK is an enhanced model to support high resolution video. The Linkskey LDV-DM04ESK Dual Monitor DVI KVM Switch is designed specifically for sharing two DVI Monitors/Flat Panel Displays among four Dual DVI Monitor-enabled PCs. You can use it to control four Dual DVI Monitor-enabled PCs using only one keyboard. one mouse and Dual DVI monitors/Flat Panel Displays. The Linkskey LDV-DM04ESK is an enhanced model to support high resolution video. The LDV-DM204AUSK Dual Monitor DVI KVM Switch is designed specifically for sharing two DVI monitors/Flat Panel Displays between four multimedia computers with Dual Head display [DVI + DVI]. The LDV-DM204AUSK features the latest True Transparent USB (TTU) Emulation Technology for advanced types of keyboards and mice. It also supports all time full DDC emulation for ultimate video compatibility with all graphic display scenarios with the latest operating system such as Windows 7 and Mac OS X. With LDV-DM204AUSK. you can access and control four dual head PCs using only one USB keyboard. mouse and two DVI monitors/Flat Panel Displays. together with audio and mic . A digital video resolution of up to 1920 x 1200 and analog video of up to 2048 x 1536 is supported for your convenience in adapting to your display requirements. The Linkskey LDV-DM702AUSK Dual Monitor DVI/DVI KVM Switch is designed specifically for sharing two DVI monitors/Flat Panel Displays between two multimedia computers with Dual Head (DVI+DVI) display. With Linkskey LDV-DM702AUSK. you can fully control two Dual Head PCs using only one keyboard. mouse and Dual DVI monitors/Flat Panel Displays. The Linkskey LDV-DM704AUSK Dual Monitor DVI/DVI KVM Switch is designed specifically for sharing two DVI monitors/Flat Panel displays among four multimedia computers with Dual Head (DVI+DVI) display card. With LDV-DM704AUSK. you can fully control four Dual Head PCs using only one keyboard. one mouse. and two monitors/Flat Panel displays. The Linkskey LDV-DM714AUSK Dual Monitor DVI/VGA KVM Switch is designed specifically for sharing two monitors/Flat Panel displays. one DVI and one VGA. among four multimedia computers with Dual Head (DVI+VGA) display card. With LDV-DM714AUSK. you can fully control four Dual Head PCs using only one keyboard. one mouse. and two monitors/Flat Panel displays. The Linkskey LDV-DM722AUSK Dual Monitor DVI/DVI Dual Link KVM Switch is TMDS-compliant and specifically for sharing two large-sized DVI monitors/Flat Panel Displays between two multimedia computers with Dual Head (DVI+DVI) display. With Linkskey LDV-DM722AUSK. you can fully control two Dual Head PCs using only one keyboard. mouse and Dual DVI Dual Link monitors/Flat Panel Displays. The Linkskey LKS-FCS32C-20 is a Gigabit Ethernet to Fiber Converter. It extends the range of your LAN through the fiber link. KVM switches are hardware devices which allow you to control multiple computers from a single keyboard, video display monitor and mouse. They come handy in data centers to ease tasks. We have smart keyboard/mouse switch, 4 way KVM for PS2, 2-port DVI USB KVM switch, 2-port DVI USB Audio Mic KVM switch, Linkskey dual monitor enhanced DVI KVM switch, Single-mode SC fiber converter, Slim Palmtop USB audio and Mic KVM switch, KVM switch box with cables, Mini USB KVM with cables, and many other products available with different specifications. All our products are RoHS compliant and environment friendly. We source all the products directly from the manufacturer, hence eliminating the cost of middlemen which helps us to keep the costs minimal. We work with dedication to achieve customer satisfaction and provide lifetime technical support on all our products.